Recently, my daughter asked me to run in a local 5K. I asked her why she wanted to do this and she said “I want a medal.” While I was enthused at this new physical challenge with her, I was also concerned as to her reason for doing it. Vince Lombardi said that “winning isn’t everything, it’s the only thing.” Alfie Kohn describes that one can easily see how childhood is filled with this competitive mindset of winners and losers. College scholarships, beauty contests, one-act play competitions, purple ribbons at county and state fairs, state sports tournaments and college admissions are a few that come to mind and there are many more. Each of these has clearly defined winners and losers. But our youth are stressed out. There has been discussion about how our hyper competitive society is taking a toll on our youth, both physically and mentally. It has potentially wider consequences in our capitalist society. It can widen gaps between “have” and “have-not” groups and block connections and even contact within these groups. I propose an alternative: Let’s have cooperation and empathetic understanding and find ways to reduce the harmful effects of competition. First, immediately change the competitive nature of your learning environment. Some examples to eliminate are: “first one to finish…” or displaying the top accomplishment at the expense of others. Second, promote activities that show collective success, such as a service-learning project, group poetry or playing a sport to a draw. In some indigenous communities, a healthy mix of cooperation, rather than competition and rewards are collective. Offering these activities is a great way to build empathetic understanding and one in which one objective is to get to know other people. Both process and product are validated. Gaining a mutual understanding can potentially remove the artificial drive to compete. This appoach really starts locally and requires a mind-shift in your planning. It’s essential to hold up the values of the activity and ensure that opportunities to build strong connections are present. It worked for me with my daughter. After she and I finished the 5k run and we got our medals, I asked her why she wanted to run with me and she said, “to spend time with you, daddy.” I couldn’t have been more proud. What effects are you seeing from youth competition? Do you have any good ideas to promote cooperation and empathetic understanding rather than competition? Do you agree with Vince Lombardi? What are your thoughts? Hey Josh, This is a topic we talk a lot about at our house with a coach in our ranks. Competition and early sports development are a super tricky subject. I think one issue we have in the US today is that we have moved all youth athletic competition to organized sports. Kids are getting less time messing around together in the neighborhood and instead are doing traveling sports in early elementary school. I like your idea of focusing on connection, and I would add in- let's do some more "low stakes" play early in life. My coaching husband would also advocate for having kids explore lots of sports all the way through middle school instead of tracking into one exclusively. What do you think? I agree, exploring more sports instead of focusing on one is better. As for your 'low stakes' play, I have decided to work for retirement because while my daughter is talented in many areas - we do not plan on her making it as a professional athlete. Messing around the neighborhood is very much needed, rather than weekends at a hotel. I to agree with Sam's idea (& her husband) of having kids explore lots of sports through middle school instead of focusing on one. I would add, not just sports, but other activities as well - 4-H, arts, dance, etc. This is a topic that ignites a fire in me. I'm not a competitive person, but I work for an organization that utilizes competition in it's programming and I have three daughters that have been successful in their athletic skills at the youth, high school and college level. We can't get away from competition. Some people thrive on it - others shy away from it. We need to help youth understand it and work within it. This takes knowing the youth - their skills, strengths and behaviors. I have seen success for my daughters in youth competition. They have been fortunate to have coaches that take a positive youth development approach as well as develop the group of athletes as a team. As a parent, I have helped my daughters sort through the joys and struggles of competition. Being involved with a team sport, my daughters have learned about people and how to work with others - a skill they will use for the rest of their lives. I agree that competition can get out of hand. I believe it's our role as adults to help youth navigate the reasons to compete and if they are willing to except the outcome. I also believe there are many life skills to be learned in a competitive field. We have to help our youth navigate those skills. Hello Karyn, sounds like your kiddos can see the bigger picture and PYD was a piece of that. When it comes to winning and losing, how do you instill those types of values there? And yes, some people do thrive on competition. It's a philosophy we have in our house. Winning is fun, but losing is part of the equation. And it's just a game. We also didn't focus on the loss. We focused on if they tried their best and had fun. As they got older, I might have asked what they or the team could have done differently. I wouldn't let them blame themselves, others or the coach. I would talk about others having an "off" day and the need for others to step up - work as a team. This is an interesting topic and I have enjoyed reading some of the thoughts on this idea. Being a parent of three individuals who all competed at various levels, in a variety of sports and activities and my wife and I doing some coaching and observing other coaching I think this is also a larger societal issue. My one daughter is a very competitive individual when it comes to sports. Now she is not out for the awards or recognition it is a personal motivation for her. Her involvement is more about pushing herself rather than the trophy or award. In fact she does not like the publicity with her accomplishments. It is more about pushing herself to the limits. I think there needs to be a balance as well as proper communication about participation in sports. Like anything if done right there are many rewards but many times we see it being done the wrong way (at all levels). I feel all adults need a reality check at times to help them remember what it is all about. 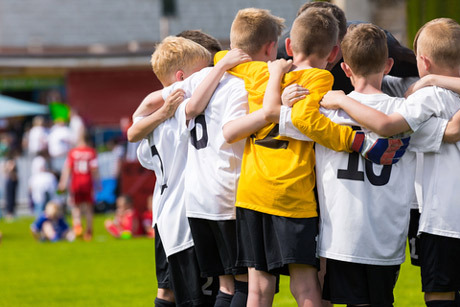 Either team or individual proper conversation and discussion should happen with youth who compete in sports or other activities where competition is involved. Those of us in youth development see the "dark side" of adults when competition gets out of hand. I loved hearing about your daughter as she is a competitive individual - but for pushing herself. How did that come about Brian? Was it natural? Was there a culture of competitiveness? Thank you for initiating conversation on this topic. I find the younger youth that I work with respond better to, and even gravitate towards, cooperative learning games. Last week, at the White Earth Math and Science Academy, I played a game where teams had to cooperative to achieve the goal, but were not told that the successful strategy required cooperation. The younger group (4th grade) was the only group that was successful at the game. This correlates to youth development approaches that consider age appropriate activities, and I keep hoping that this will trickle down (or up) to the youth sports arena. My blog on Early Sports Specialization (http://blog-youth-development-insight.extension.umn.edu/2016/06/early-sports-specialization-is.html) also validates your points. I agree with comments above that competition can be healthy - it seems it takes adults who recognize that healthy competition isn't about winning, but what you learn about yourself.